Tracking the Light EXTRA: LUAS Green Line to Dawson. Yesterday (Wednesday 19 September 2018) high winds attributed to storm Ali resulted in widespread transport disruption across Ireland. Some railway lines were closed because of downed trees. It was reported that a Galway-Dublin Intercity Railcar (ICR) was damaged when it struck a tree. 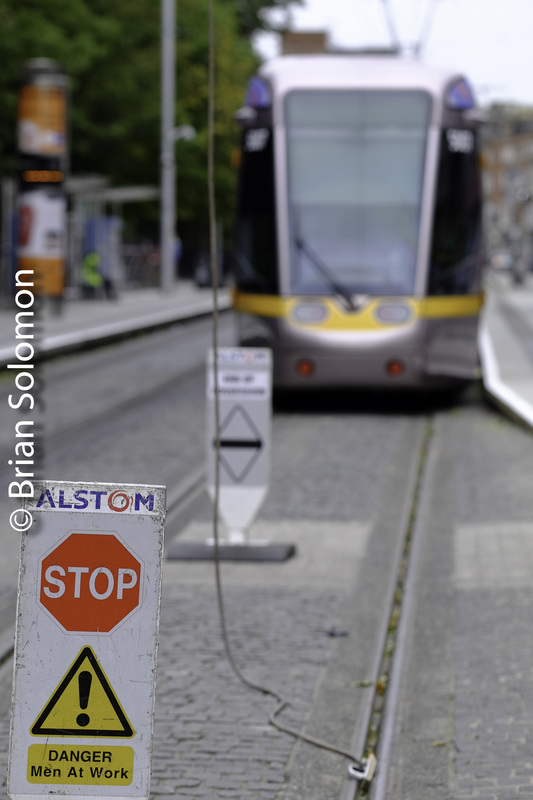 In Dublin,LUAS Green Line overhead wires were damaged and service suspended between Cowper and Dawson in the city centre. 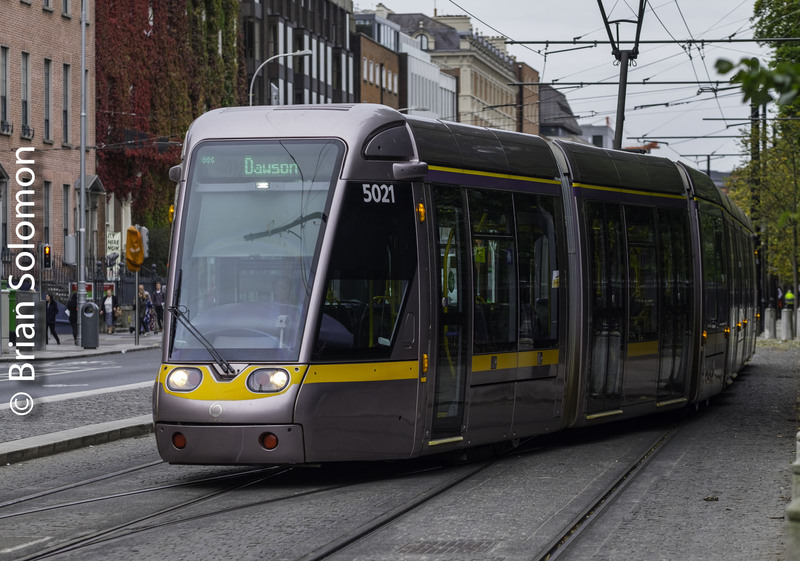 As of this morning, LUAS was still only operating a limited service in the city centre and on the southern extremities of the Green Line route. I went to explore the turn-back operation relating to the temporary Dawson terminus. While trams were only carrying passengers as far south as Dawson Street, the trams themselves were running toward St. Stephens Green to use the facing point crossover on the north side of the Green to reverse direction. 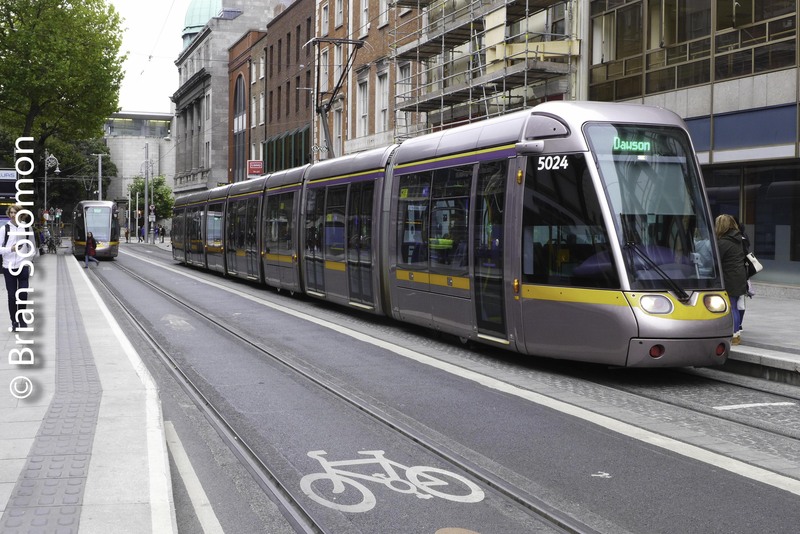 Dawson LUAS stop on Dawson Street in Dublin. Notice the unusual destination at the front of the tram. Lumix LX7 photo. 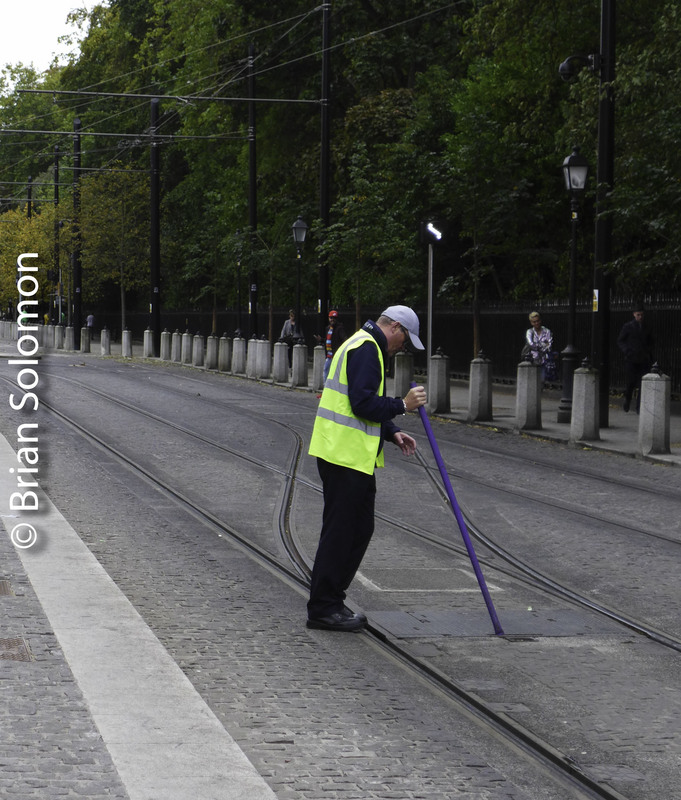 Tram drivers were manually operating crossover points at St Stephens Green. Lumix LX7 photo. 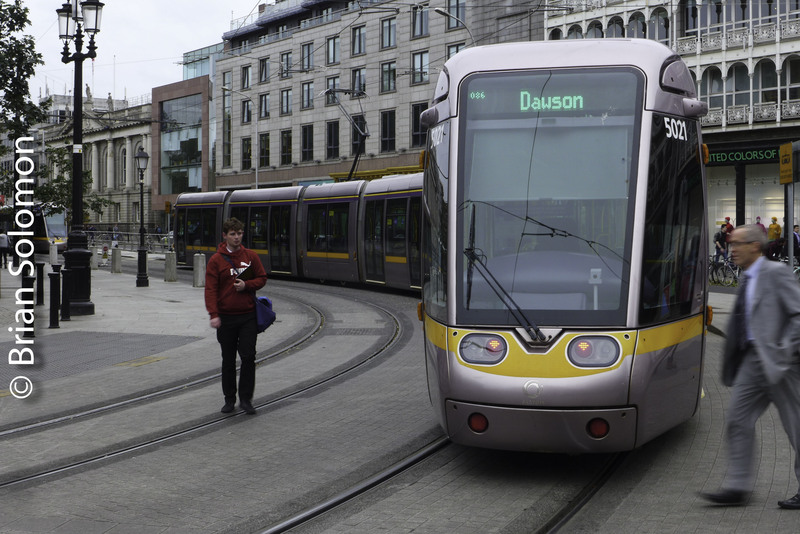 Dawson displayed in a tram reversing at St Stephens Green. Lumix LX7 photo. 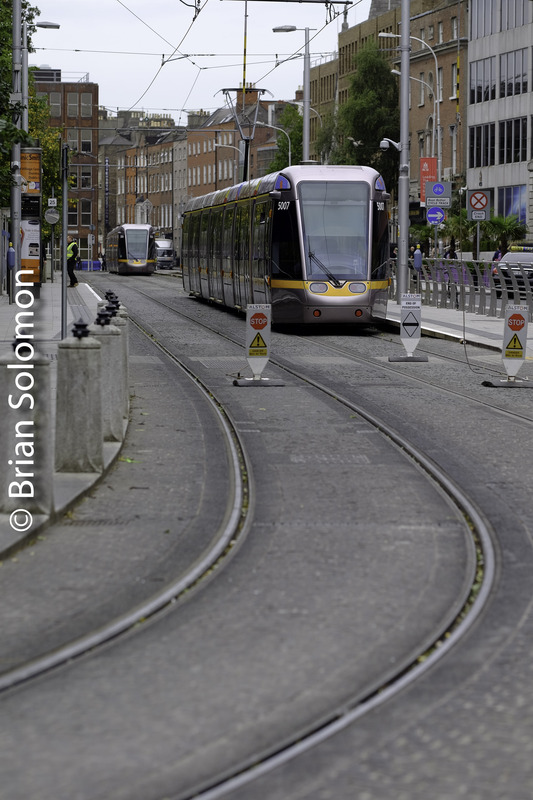 Stranded trams beyond the end of live wire at St Stephens Green. FujiFilm XT1 photo with 90mm lens. FujiFilm XT1 photo with 90mm lens. A tram navigates the St Stephens Green facing point crossover. FujiFilm XT1 photo with 90mm lens. Photos were exposed digitally this morning, 20 September 2018. DAILY POST: Irish Rail at Ballybrophy, June 2006. Ballybrophy is a rural station on Irish Rail’s Dublin-Cork main line. It’s probably the smallest community on the route to retain an active passenger station and survives as result of it being the connection to the Nenagh Branch. Most trains blitz the place at track speed. A few miles east of the station is a summit known as the top of Ballybrophy Bank. Here a lightly used road crosses the line on a bridge which offers a nice view for Cork trains. A Dublin-bound train led by an 071-Class flashes through Ballybrophy. What this photo can’t convey is the sound. I could hear this General Motors locomotive in full ‘run-8’ (maximum throttle) for several minutes before the train appeared into view. Powered by a 12-cylinder 645 turbocharged diesel, this machine makes a characteristic drumming sound that permeates the landscape. The sound receded as the train charged to ‘the top of Bally Bank’. Contax G2 rangefinder with 28mm Biogon lens. I’ve made many visits to Ballybrophy over the years, both to ride the Nenagh Branch and to photograph trains on the mainline. These images were exposed on an unusually sunny June 3, 2006 using my Contax G2 rangefinder. The classic old stone railway station at Ballybrophy is a treasure. There’s plenty of time between trains to study the architecture. Contax G2 with 45mm lens. Freshly painted Irish Rail 215, a General Motors-built 201 class diesel, leads a Cork-bound train that has just crested ‘Bally Bank’ on its down-road run. Contax G2 with 28mm Biogon lens. Historic Vehicles on Display at Covent Garden, London. I’ve visited the London Transport Museum on several occasions, owing to its convenient location at Covent Garden in central London, and my general interest in transport. Central to the public displays are a variety of historic conveyances ranging from horse-draw omni buses and horse cars to tube trains, buses, a double deck tram and a lone trolley bus. Perhaps more important than the equipment is the context the museum offers. London is one of the most transit friendly cities in the world and has a long history of offering public transport. This year the London Underground is celebrating its 150th anniversary. As part of the city celebrations, the London Transport Museum has a display of Underground posters. On my July 2013 visit, I made a few photos of the equipment on display at the museum using my Lumix LX3. Vintage London Tube car on display at the London Transport Museum. Lumix LX3 photo. This Victorian-era tube train displays a relative dearth of windows. Lumix LX3 photo. Looking down a set of stairs on a double deck tram. How was the use of steps regulated when the tram operator was at the front of the car? Anyone? Lumix LX3 photo. A brief photographic tour from April 2013. Signage around Kings Cross helps place renovations and modernization in context. St Pancras looms in the distance. Lumix LX3 photo. During my wanders around London in April 2013, I visited a variety of London’s stations. For me, London’s stations are far more interesting than the trains. Where the trains tend to be fleets of modern multiple-units, the stations range from Victorian gems to austere examples of Lego-block architecture. My favorite station is St Pancras. This is a classic railway cathedral. A few years ago it was transformed in to a modern multimodal center. Today, it serves as an international station as well as both a long distance and commuter railway station. It features a shopping mall and luxury hotel. Most impressive is the original architecture, including the pioneer example of a balloon-style arched train-shed, which has been successful integrated into a modern facility. St Pancras: railway cathedral as viewed on April 20, 2013. Lumix LX3 photo. On April 19, 2013, light tickles a Eurostar highspeed train under the famous shed. Lumix LX3 photo. Modern additions to St Pancras offer a contrast to the Victorian splendor of the original station. Lumx LX3 image exposed on April 20, 2013. Kings Cross is adjacent to St Pancras. This has also been recently transformed, and blends historic and contemporary architecture. Interestingly, Kings Cross may be most famous for its mention in the Harry Potter stories. Today, there’s both a Harry Potter shop and a light-hearted platform 9 ¾ for visitors. Kings Cross on April 18, 2013 after a spring shower. Renovations are on-going. Lumix LX3 photo. Today, Kings Cross is a blend of contemporary and historic architecture. Lumix LX3 photo exposed on April 22, 2013. A 1970s vintage HST under the shed at Kings Cross. Years ago I saw graffiti scrawled on the side of an American boxcar that read, ‘Kings Cross is the best, forget the rest.” A line from a song? These days Kings Cross is best known because of its role in the Harry Potter stories. On this trip, I passed through London Bridge station and was shocked to see that the old train shed has been demolished! All I saw was a few vestiges of the old iron columns. Fifteen years ago, I made some memorable images inside the shed, and now that it’s gone, I’ll need to dredge these photos from the archives. Another change at London Bridge was nearby construction of a monumental skyscraper, colloquially known as ‘The Shard’. The Shard looms over London Bridge Station on April 20, 2013. Lumix LX3 photo. A First Capitol Connect train rolls into Blackfriars on April 21, 2013. Canon EOS 7D photo with 28-135mm lens. Not to be forgotten is London’s Charing Cross, located near Embankment, and just a short walk from Trafalgar Square. Lumix LX3 photo on April 19, 2013. Victoria Station; two terminals with one name. Waterloo Station, is one of London’s busiest. Waterloo is named for the Belgian town where Wellington prevailed over Napoleon. Ironically, this was the London-Paris Eurostar terminal for more than a decade before international services were shifted to St. Pancras. Lumix LX3 photo. Like New York’s late, great Pennsylvania Station, the classic Euston Station was demolished in the 1960s to make way for uninspired modernity. Progress doesn’t necessarily make things better. Lumix LX3 photo. This statue of British Railway pioneer Robert Stephenson is displayed in front of Euston Station. Euston, Heuston, what’s in an ‘H’ anyway? LX3 photo. Clapham Junction is famous as Britain’s busiest station. Still images cannot convey the power of place. Watching trains at Clapham Junction is akin to watching the tide flow in. At rush hours an unceasing parade of trains passes Clapham Junction, with trains flowing in waves. Most impressive is standing at the north end of the station when as many as six trains approach simultaneously. Clapham Junction is difficult to properly appreciate in still photos. Buses converge outside of Clapham Junction Station on April 22, 2013. Canon EOS 7D with 28-135mm lens. Clapham Junction Platform 13 destination board on the evening of April 22. London Underground April 2013 – Part 1. Irish Rail ICR near Islandbridge, Dublin, February 18, 2013. Canon 7D with 40mm pancake lens; ISO 200, f11 at 1/30th second. Here’s a panned view of an Irish Rail intercity railcar near Islandbridge, Dublin that I exposed a little while ago (February 18, 2013). A pan of a 22K-series ICR? No, this isn’t a litany of complaint regarding the common Rotem-built Irish Rail intercity vehicle. Rather, it’s an example of one of my favorite techniques for showing motion. I learned to pan from my father, who used the technique to compensate for slow speed Kodachrome film. In the early 1960s, he made some stunning rainy-day images of Pennsylvania Railroad’s Baldwin ‘Sharknose’ diesels working the New York & Long Branch. Check my Vintage Diesel Power by Voyageur Press to view some of these photos. The trick to making a successful pan is to manually select a moderately slow shutter speed (1/15th to 1/60th of a second), then follow a train with the camera, gently releasing the shutter at an appropriate moment. I find that pivoting my whole body helps makes for smoother motion. Key to this exercise is planning to continue the panning motion after the shutter is released. Stopping too soon may result in unplanned blurring of the main subject. Also, I usually pick a fixed point in the frame to follow the front of the train. My Canon 7D has lines on the viewfinder screen that aids this effort. I’ll discuss the panning technique in greater detail in a future post.